One morning before the parade. I wake up to a weird noise. I look at the clock. 4:30 a.m.
Mo is asleep. I get up to investigate. Because i am a brave male. This is what we do. As I round the corner and start down the hallway in the dark, I see the cat. She’s in Full Terror Mode. She is running at top speed while staying low to the ground, the stance she assumes in a crisis. The weird noise is closer. I look up. And squeal like a little girl. A huge creature is coming at me down the hallway. Hello Kitty. I start to turn and make a run for it along with BK. Then I see Mo behind it. 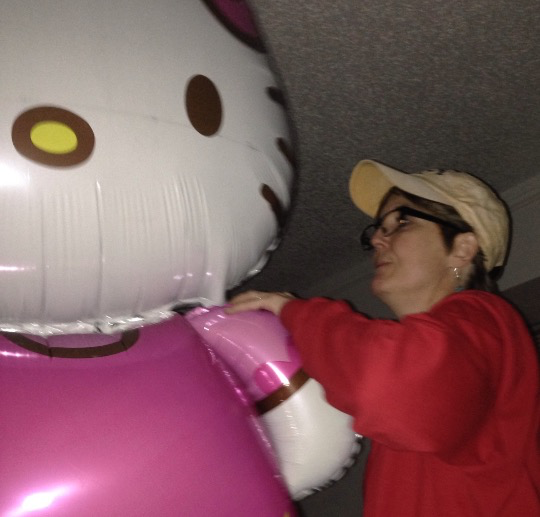 She is taking Hello Kitty to the bathroom so as to not terrify BK. It isn’t working. Mo in the bed was actually sleeping bag in the bed. As I hyperventilate, Mo laughs and laughs. It was totally an accident, but she appears to have no remorse. Mo is a Bad Person. And it appears to be our new thanksgiving tradition. Upside: Waking up for six-hour drive no longer a problem. 1 Response to One morning before the parade. Happy Thanksgiving Gary and Mo, BK and Hello Kitty.